Why Should My Child Get Braces at Such a Young Age? Your child’s primary (baby) set of teeth act as placeholders and guides for the permanent (adult) teeth that are yet to erupt. A significant misalignment or prematurely lost tooth can permanently alter your child’s smile. By pinpointing risk factors and making minor adjustments to their rapidly growing mouths, pediatric orthodontic treatments can reduce the risk of more major therapies or surgeries when a child is much older! Experts recommend that all children have an orthodontic evaluation by their dentist or orthodontist by their 7th birthday. At this point in development, most of our pediatric patients are experiencing a mixed dentition, that is, where the adult teeth are beginning to erupt and replace the baby teeth. It’s at this time where we can begin to tell if there is a risk for issues like crowding, impacted teeth, missing teeth, etc. During this appointment, we will take a full mouth panoramic X-ray, photographs, and impressions of the teeth to evaluate your child’s oral development and bite alignment. After we have all of this data, it’s possible to create an individual treatment plan and estimate the duration of how long the orthodontic process will take. Growth Modification, Space Maintainers, and Early Intervention — Minor issues with your child’s oral development may be possible to correct without braces. For example, a prematurely lost tooth can increase the risk of shifting and positioning of the adjacent teeth; to prevent this, we place a temporary space maintainer that keeps teeth where they ought to be, so that adult teeth can erupt without becoming impacted. Other early intervention options include things like expanders, Herbst appliances and aids that help with thumb sucking/tongue thrusting. 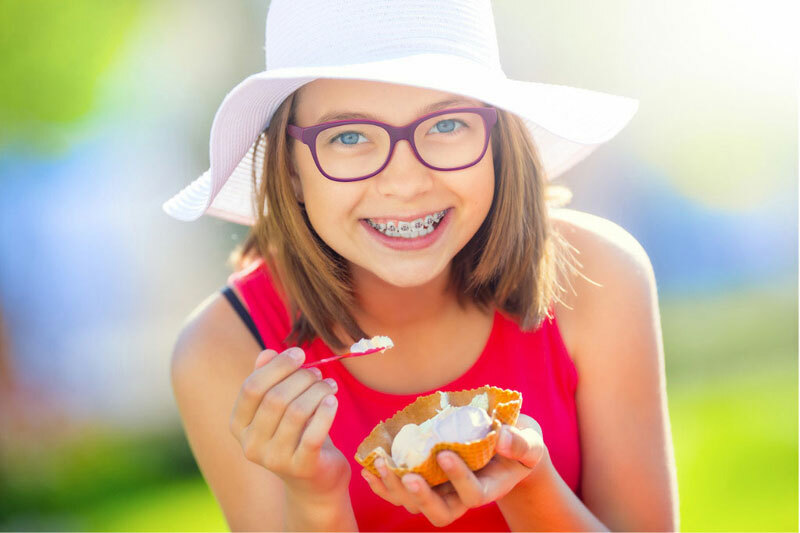 Phase I Braces / Interceptive Orthodontics — Instead of waiting until your child reaches her teen years to finally straighten the teeth, it may be necessary to break the overall treatment up into two phases. The first phase aligns teeth in a way that accommodates straighter tooth eruption and bite alignment so that bite discrepancies are not as severe once your child gets older. This can reduce the length of time it takes to correct his or her bite with Phase II braces. Retainers — After making changes and adjustments to your child’s bite, the retention phase is an extremely important step in avoiding relapse in tooth movement. A personalized retainer will keep teeth where they ought to be, while allowing for continued growth and tooth development. Most dental insurance plans will cover some type of orthodontic treatment for your child. Because braces impact the overall oral health and future dental needs of your child, we want to ensure that the process is as accessible as possible. Our providers offer affordable monthly payment plans that are simple to fit into your budget. Low-interest and 0% financing is also available. Call Wenatchee Valley Dental Village now for a no-pressure consultation and treatment quote for more information.